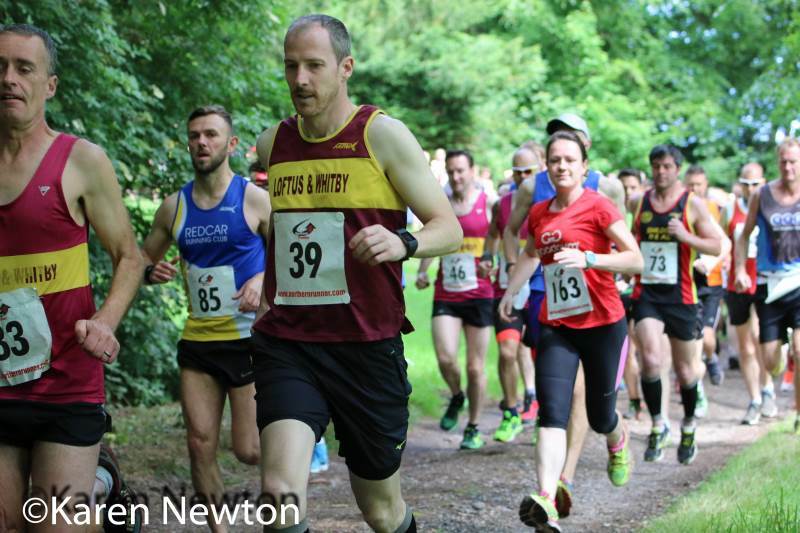 Hosted by Loftus & Whitby AC, the Mulgrave Castle 10k trail race is a joyful affair, starting with a junior race and refreshments at Lythe Sports Pavilion. All runners are requested to congregate here 15 minutes before the main race is due to start. Runners and spectators are then escorted down through the village & into the grounds of the stunning Mulgrave Castle Private estate. The race itself is not for the faint-hearted – there are many ups and downs throughout the woodland course, including a quick splash through a shallow ford, so a real test of strength and endurance. I was in about 10th position not long after the start and settling into a more steady pace after a quick 3.21 first km, with the help of a slightly downhill start. The field had spread out by the mid section, where I found myself battling to maintain my position with Darren Wood of Loftus & Whitby AC. He was definitely the stronger climber but I had the speed on the flat and downhills to stay in close contention. Undulating would be an understatement – I’d say more ‘hilly’ because if you are not going up one, you are usually coming down with not much flat in between. However, tiring in the last mile, which is a very steep uphill finish and slightly over the measured distance – I had to let 2 further competitors past. Looking at my watch I had predicting running close to 41 minutes overall until I hit the last mega climb to the finish – think Saltburn bank for half a mile and loose under foot!! I have no shame in saying I had to walk the odd stride so I didn’t completely burn out. Eventually stumbling over the line in 43.36 taking position 13. A great race overall. Very well marshalled, a supportive crowd, scenic and the woodland provides good coverage from either blazing sun or howling wind. The majority of runners wear normal road shoes as the paths are open and hard standing. Highly recommend! My only criticism would be if you are going to move the finish point, the start needs adjusting accordingly! 180 metres to be precise to that of when I ran here last 2 years ago since the finish has now been pushed back. Cover photograph by Karen Newton.